The march of zebra mussels continues. 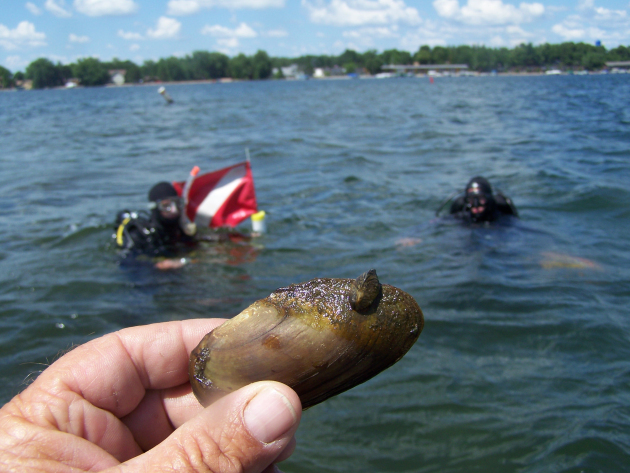 The worst fears for Pelican Lake lovers have been confirmed: DNR scuba divers have found zebra mussels in the popular Crow Wing County lake near Brainerd. (See photo above.) They were found in two separate locations during a search of the lake this week. It’s not a complete surprise. The search was a follow-up to an intensive search last November after a single juvenile zebra mussel was found on a dock. That search failed to turn up any additional mussels. DNR staff also asked the Pelican Lake Association to notify its members to report any suspect mussels, but no other zebra mussels were found. The DNR says educational and enforcement efforts to limit the spread of invasive species will increase at the lake due to its designation as infested waters. Minnesota law prohibits the possession or transport of any aquatic invasive species (AIS) in the state. AIS include, but are not limited to, zebra mussels, Eurasian watermilfoil and spiny waterfleas.